Holidays are all about the sweets, at least that’s how it seems when all those creamy cake recipes are being shared, the abundant cookies too, the fudge… We believe that savory snacks are silently making a comeback though, just as they should, because from a Paleo standpoint, sugar really isn’t all that good for us. Definitely not in large amounts, nor in small doses. So, in this nutty recipe we decided to omit every sweetener, instead focusing on the diverse flavors of the nuts and herbs. We love it, and know you will too! Macadamias are just one of the nuts involved in this mix, but rest assured the cayenne and rosemary complement them completely. Each bite is a gift of its own. They may be expensive, after all their hard outer shell requires a lot of strength to open. Yet you will be rewarded with a creamy texture when eaten raw, thanks to their high fat content. When roasted, you will still receive an abundant amount of magnesium, manganese and vitamin B1. 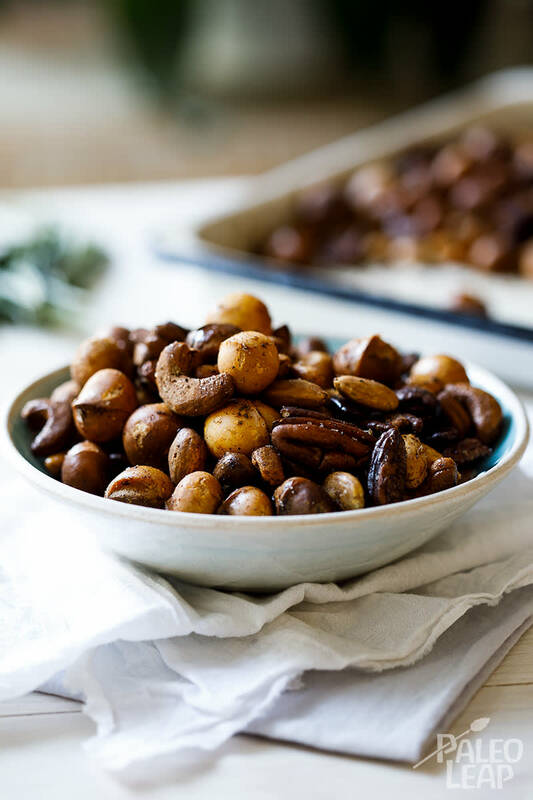 Roasted nuts are the perfect holiday snack (great for year-round snacking as well) and all too easy to nibble one at a time. A word of caution: they are highly addictive. They are crunchy, slightly spicy and intensely flavored. Remember that this recipe is for a crowd so make sure to pass the nut bowl around and share among friends. Once they cool down from their time of toasting in the oven, you can then store them in an airtight container for 2 weeks – the perfect consumable gift?! Combine all the ingredients in a big mixing bowl and mix well. Transfer to an oven-proof dish and roast for 20 minutes, stirring halfway through cooking. When the nuts are roasted, remove from the oven and allow to cool slightly before serving. Alternatively, cool completely and store in a sealed jar for up to 2 weeks.